The stone was said to have originally come from an adjacent field and then moved next to yet another monolith, which was also broken up. Can any remnants of these poor fellas still to be seen anywhere nearby? Or is it a case of yet another one bites the dust? 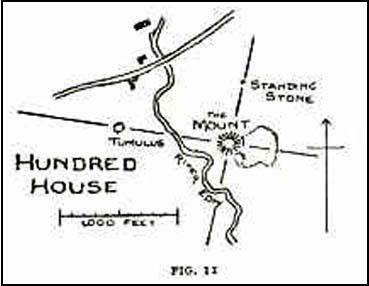 Watkins, Alfred, The Old Straight Track: Its Mounds, Beacons, Moats, Sites and Mark Stones, Methuen: London 1925. This entry was posted in Radnorshire, Standing Stones, Wales and tagged alignments, antiquities, Archaeology, Bronze Age, Hundred House, ley-lines, leys, megalithic, Megaliths, monoliths, Powys, prehistoric sites, Radnorshire, standing stone, tumulus, Wales. Bookmark the permalink.